Our long weekend was spent mostly taking care of sick children, a teething baby and traveling to the city for my first half marathon back after having baby M.
We had a fun weekend of relaxing and enjoying the kids planned, but wouldn’t you have it that the baby would decide sleeping is overrated, and my older two would come down with the cold’n’flu. In fact, they still have fevers we just can seem to kick. 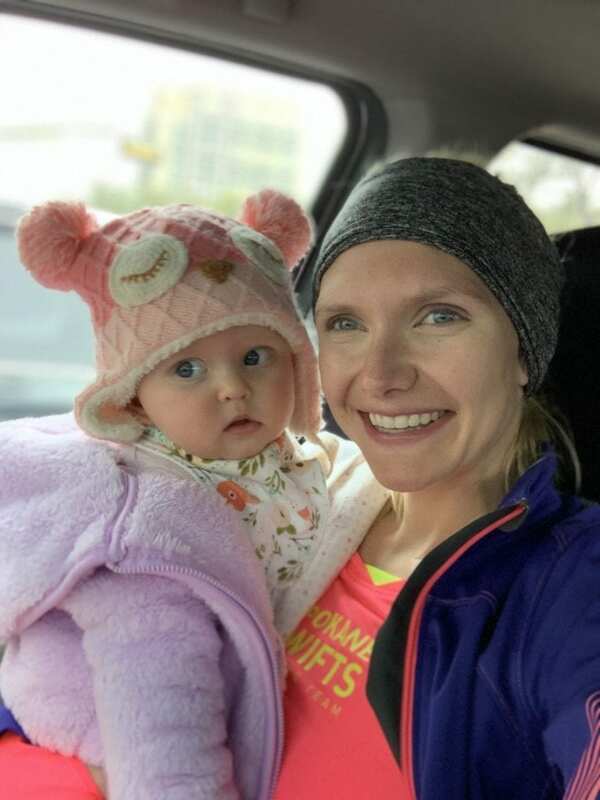 Saturday morning, after a night of no sleep tending to the baby, we woke up early to drive into Dallas for the Too Cold To Hold Half Marathon. I had high hopes of PR’ing and running a sub 1:21, but after a sleepless week I was feeling tired just thinking about it. Friends on Instagram kindly reminded me that I am first a wife, mom, and employed, then a runner. Unfortunately it is true, running is not first on my priorities. It is a priority for sure, but being a wife and mom have to come before my running and they always will, so grace should be allowed. We began the morning, with me sneaking out for a 20 minute warmup before race start. R then had to use the restroom, so while she went with Marc, I nursed the baby. 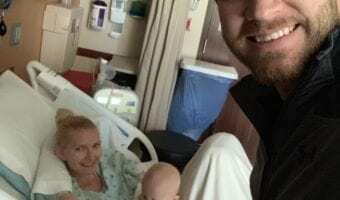 After nursing the baby for the hundredth time that morning, I handed her off to Marc and I needed to run to the bathroom. At this particular race, parking is limited, and we had to park far from the start and finish line. Thinking I would save some time, I cut through a field to get to the bathrooms. By doing so, I soaked my shoes and covered them in mud, as the field was a wet, muddy mess. My racing shoes were caked in mud and my socks soaked. I quickly used the restroom and ran back to the car. Thankfully, I had an extra pair of shoes to change into, but no extra socks. My feet were numb and wet from the cold, and my shoes old and worn out, but hey at least I had shoes right? I ran back down to the start line with 10 minutes to go until race time. I decided to pace off some guys, who were talking about 1:20 race times. A few of those guys fell off pace rather quickly, and I continued to chase the lead guys for the duration of the race, never catching them. I stayed 4th overall for the remainder of the race and was first female for the entire race. 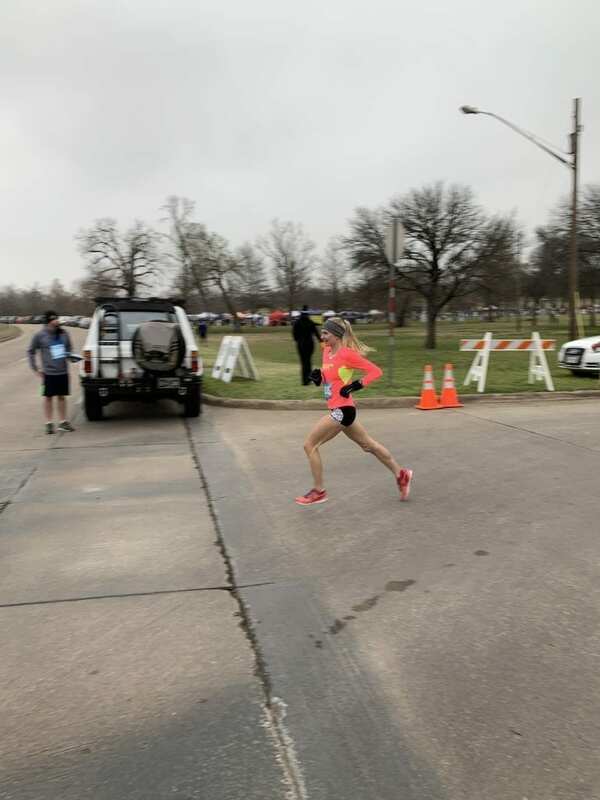 At the turn around spot, I noticed I was a few minutes ahead of the second place female, but I pushed a little more to lengthen my lead in the next few miles. My body, as far as fitness, didn’t feel tired, but I felt tired. 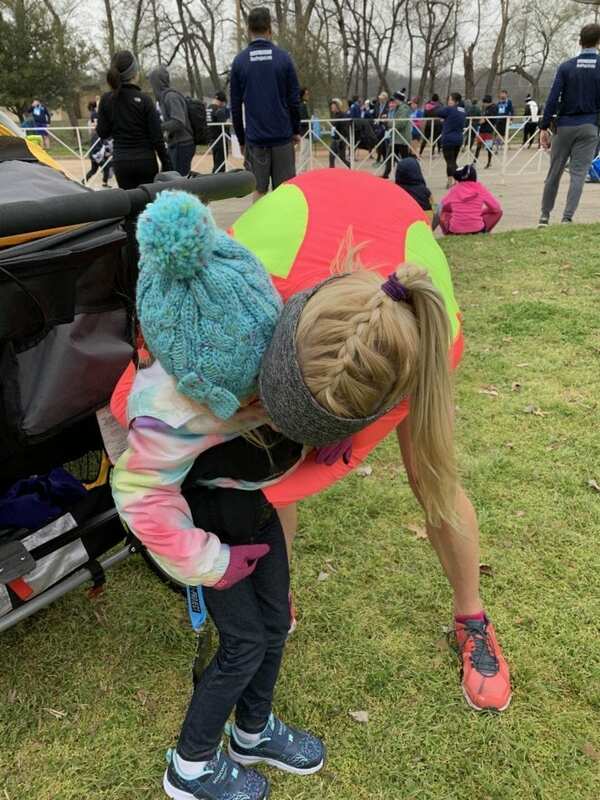 There’s a difference between tired from racing, and tired from life as a mom. I was more tired from my life as a mom from the week before, than from the actually racing I was doing. My legs were turning, but around mile 8 I felt like I was crawling and that my pace had dropped. In reality I had pretty consistent splits. Around mile 10, I finally looked at my watch and saw that my pace was still around 6:15. This surprised me, because I felt I was going so much slower. 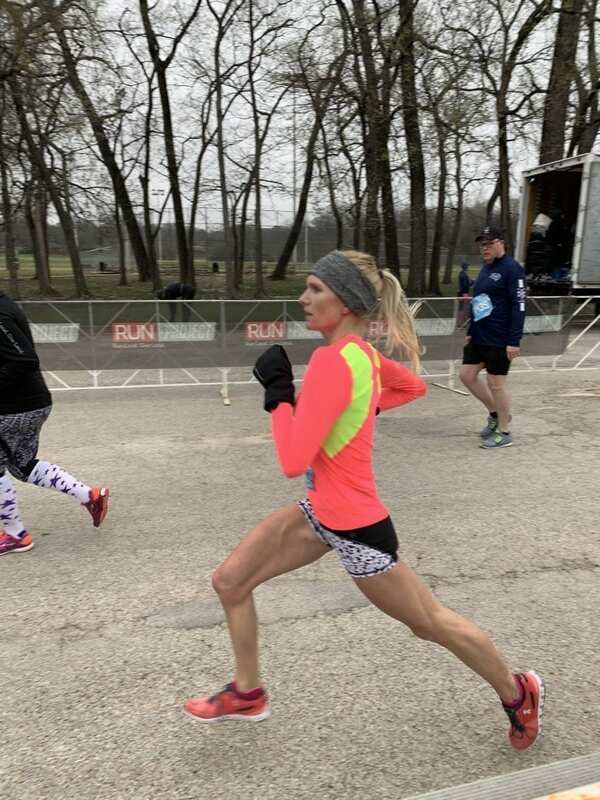 It was 35 degrees for race morning, breezy off the lake and a bit misty from the lake The last 3.5 miles were not entirely fun, weaving through people. It was an out and back course along White Rock Lake, and there was a 5k and 10k as well, which started 30 minutes after the half marathon. Due to having 5k and 10k runners too, near the end of the race you are weaving through a lot more runners. There were runners still on their out and others on their back. The trail is wider, but I would be weaving through runners, as they covered both sides of the trail. The extra weaving, took it out of me, and I felt I was slowing more and more. Funnily enough, my slowest mile was early on in the race at mile 2 and the last 3 miles, which I credit to the weaving. I wasn’t happy with the results of this race. I did manage to PR by 2 seconds with a 1:21:33, but I am feeling as if my fitness is not where I want it to be. I don’t seem to be bouncing back as fast as I did with the other two kids. Having 3 kids has taken it out from me. I have been learning from this race though and the previous races. It’s important I dial in on my nutrition and sleep, as well as letting go of some things that are not high on priorities. It was a good race to see where I am sitting right now, but I do think I can easily drop my half marathon time by a few minutes. I just need to feel a little more motivated. Honestly, I wasn’t motivated race morning and felt like I was dragging myself through the miles. It felt more like long speed workout than a race for me…..just another day. Currently I feel I am in a running funk. Here’s to more races & chasing down those dreams!! Tune in next week for one of my favorite breakfast recipes! !